1. To pass out of sight; to vanish. 2. To cease to exist; that which can not be seen nor found. 3. To get lost; especially, without a warning or an explanation: "Her son disappeared without a trace." 4. To cease to be seen; that is, by moving away or going behind or into something. 1. The act of disapproving or condemning; censuring. 2. The expression of disapproval. 3. A feeling of disliking something or what someone is doing. 4. 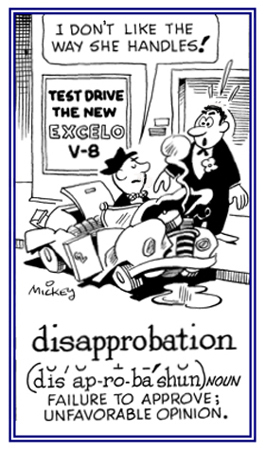 An inclination to withhold approval from some person or group. 5. A feeling of disliking something or what someone is doing. Showing page 6 out of 35 pages of 513 main-word entries or main-word-entry groups.